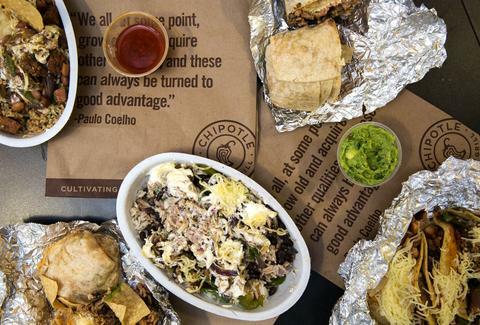 From free chips and guac to buy-one-get-one burritos, Chipotle has served up several promotions for free food this year as part of its ongoing campaign to win customers back after its devastating food-borne illness incidents. And now, the burrito chain is about to take things to the next level this Friday with the launch of an all-new summer rewards program called Chiptopia. Translation: more free food for you. 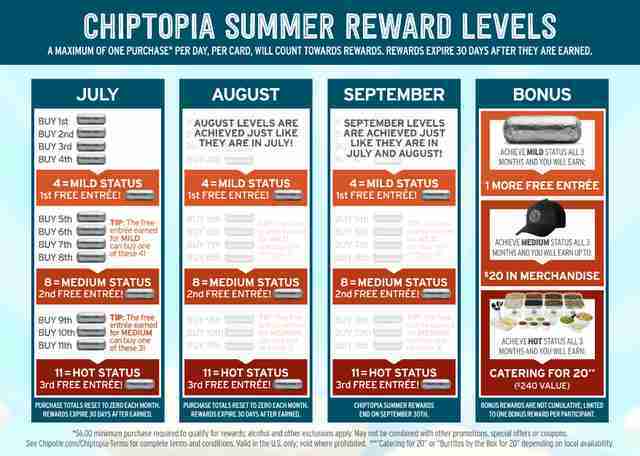 Chiptopia doesn't seem to work like your typical fast food or coffee chain rewards programs. For one, it's only a temporary promotion that will last for the next three months (July through September), according to a press release from the company. And whereas other programs give you points for every dollar you spend, Chiptopia works by rewarding you with free entrees based on how many times you buy a meal at Chipotle within a month. Each meal (costing at least $6) that you buy will count towards three different monthly rewards statuses -- Mild, Medium, and Hot -- with four meals earning you Mild status for the month and your first free entree. Customers who register for the program in July earn a free chips and guacamole with their first entrée purchase. Oh, and one more thing: If you earn the same rewards status for all three months of the rewards program, Chicpotle will give you BONUS rewards: another free entree for earning Mild all three months, $20 in Chipotle merchandise for earning Medium all three months, and catering for 20 people (a $240 value) for earning Hot all three months. That's some serious loyalty. The apparent learning curve aside, Chiptopia will mark the first time Chipotle has launched such a loyalty program in its nearly 23 years of making burritos, which is a pretty damn big deal. Execs at the company first teased the idea of a rewards program and even new menu items like chorizo during a quarterly earnings call back in April. Still no word on when that chorizo is coming, by the way. Tony Merevick is Cities News Editor at Thrillist and thinks the best food is free food. Send news tips to news@thrillist.com and follow him on Twitter @tonymerevick.